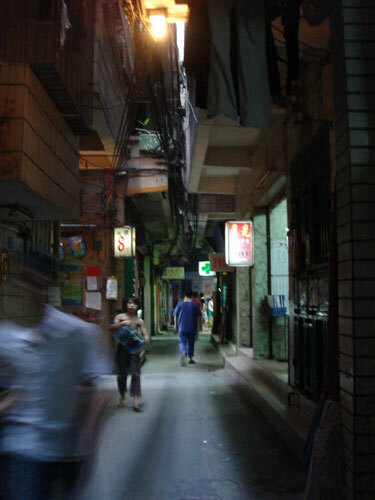 Last week, on recommendation of my friend Rem, I made a visit to Shi Pai, a neighborhood in Guangzhou. Shi Pai is an “urban village,” a human anthill generated without a plan and occupied mostly by the city’s “floating population” of unregistered, migrant workers. 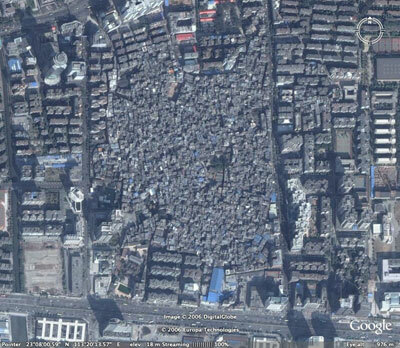 There are few in Guangzhou, this one is the biggest I think. Like the others, Shi Pai started as a rural village, occupied by farmers who held rights over it in an occasionally messy system of collective land ownership. In the late ’70s, the area around Guangzhou was declared a Special Economic Zone, and the city became a laboratory for the PRC’s first experiments with the free market. 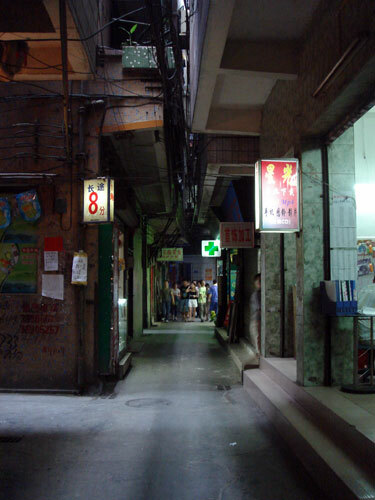 Genie out of the bottle, villages like Shi Pai were soon engulfed in Guangzhou’s uncontrollable growth. Land ownership meant that the farmers could exploit the commercial possibilities of their community’s new centrality, and in a matter of years they transformed the farmland into tenements and farmers into landlords. That’s extremely simplified, but, I think, basically accurate. 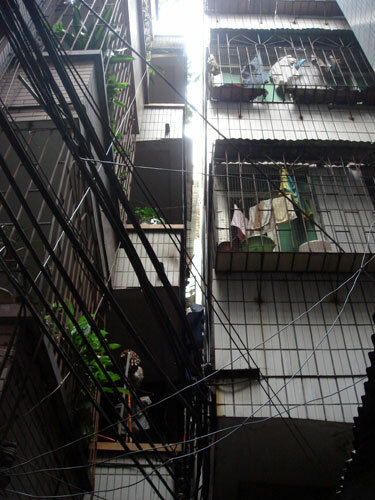 Without a planner or even oversight, Shi Pai mutated into city-in-a-city of unimaginable density. How dense? That’s taken from Google earth. In order to have more rental space, the original buildings were extruded into mini skyscapers. Cantilevered floors were added onto the towers in order to maximise the floor area, creating what my architect friend told me is called a “handshake” street profile, a tiny distance of about 50 cm between two facing balconies. The density of the buildings gives the impression of being roofed in – like rain forest canopy. It blocks out the sun, and renders everything vaguer and more intimate. It seems impossible to navigate. Any turn could lead to a dead end, to a trash heap, someone’s living room. On the tiny pathways there are streams of dark, contaminated water that confuse the senses – unattractive to the eyes and nose, possibly deadly to the mouth, pleasant to the ears. There seem to be a disproportionate number of shops providing links to the outside world – mobile phones, internet cafes, copy/fax shops, telecom… – something like you’d expect to find in a human colony at the center of the earth. After walking/gawking around for a couple hours, I suddenly noticed the sun was going down, and I had no idea how to get out. There’s a strong, instinctual sense that darkness will bring danger in a place like this. And, of course, I wasn’t blending into my surroundings very well. As if by miracle, I eventually made a turn and wound up at a basketball court somewhere near the western edge and made it out. I’m gonna try to go back tomorrow. Read: Did someone say participate? 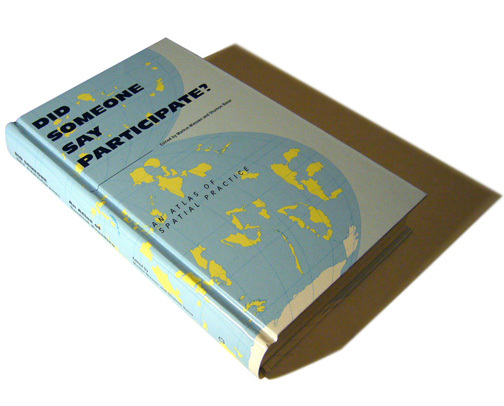 My partner Charlie brought me back a copy of “Did someone say participate?” – a new book put together by friends and all around doing it dudes Shumon Basar and Markus Miessen.